Chlorphenamine 4mg tablets are antihistamine tablets containing the active ingredient Chlorphenamine Maleate, which will block the actions of histamine, therefore relieving symptoms associated with allergic reactions. 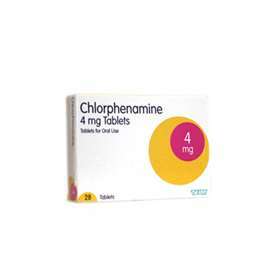 Please note: Packaging and Brands may vary but the active ingredient will remain the same, Chloraphenamine Maleate 4mg. These tablets are suitable for treating allergic conditions such as hay fever, rhinitis, urticaria, pruritis, insect bites or stings, food allergies and pet allergies. 28 small round yellow tablets. Treats and relieves symptoms of allergic reactions. Chlorphenamine Maleate will relieve allergic reaction symptoms such as itchy skin, runny or blocked noses, rashes, itchy or watering eyes, sneezing and blocked sinuses. Recommended dosage unless instructed by a physician. Adults and elderly: One tablet (4mg) every 4-6 hours. Do not exceed more than 6 tablets in a day. Children 6-12 years: Half a tablet (2mg) every 4-6 hours. Do not exceed more than 3 tablets in a day. 4mg Chlorphenamine Maleate. Tableted with, Lactose, Maize Starch, Magnesium Stearate, Colloidal Silicon Dioxide, Quinoline Yellow (E104) and Sunset Yellow (E110).